The watch world is a lot of fun, but I think it’s safe to say we can take ourselves quite seriously. When it comes down to it, we all love watches for how they make us feel and how they help us express ourselves. So today, we’re looking at some of our favorite watches that make a more bold, playful statement with a colorful dial. There’s something for everyone here – let’s have have a look. If you’re looking for just a splash of color, the Sea-Dweller Deepsea is an excellent choice. 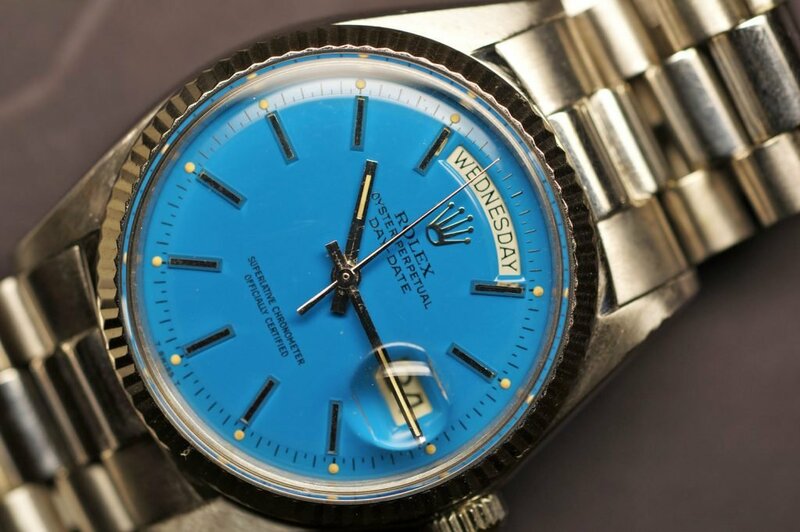 Although, as one of the most popular and recognizable watches produced by Rolex, it’ll be far from discrete. 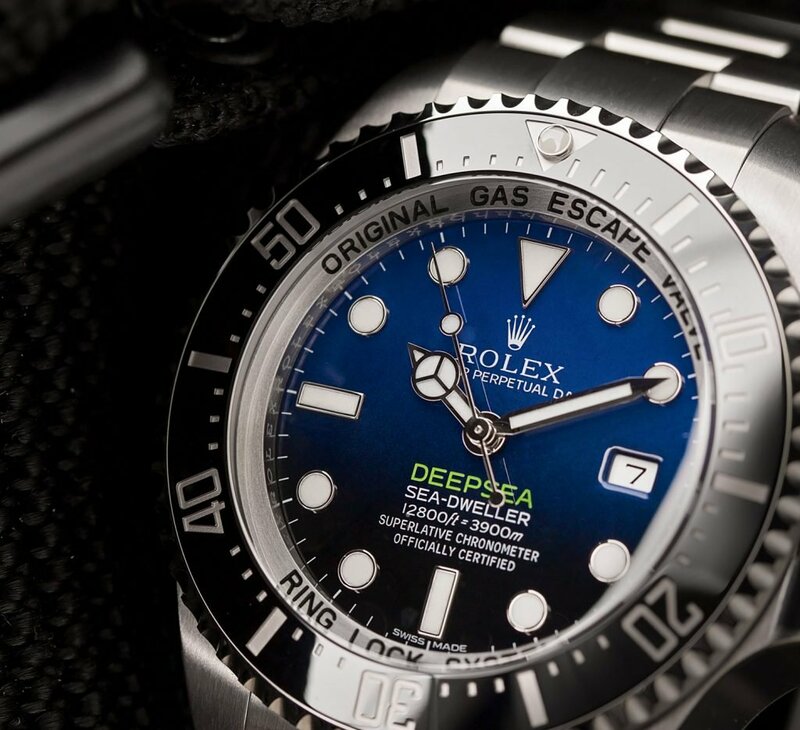 The iconic blue-to-black colored face of the Sea-Dweller Deepsea is equally stunning and difficult to create – the watchmaker having to carefully forge the metals together to achieve this unique look. Besides the color, this watch offers the wearer extreme durability. Outfitted with an Automatic 3135 movement, it’s also water resistant up to 12,800 feet and features a helium escape valve. The oversized 44mm titanium case, stainless bracelet and scratch-resistant sapphire crystal only add to the extreme durability. 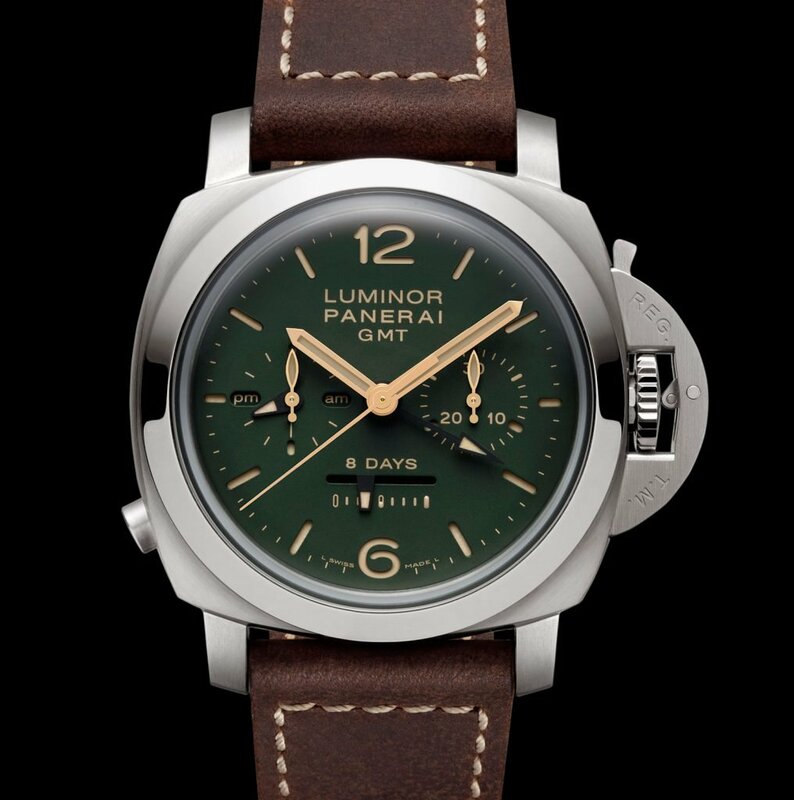 The face of your Panerai Luminor is bound to leave onlookers green with envy. Not only is the matte green dial striking, it was released as a limited edition model to the Luminor with only 200 watches ever going into production. Panerai released this deep, almost evergreen dial in 2017 after successfully launching a limited edition blue dial collection the year before — it was obviously an instant hit with collectors and admirers alike. What’s interesting to note about the green Luminor 1950 Chrono Monopulsante 8 Days GMT Titanio is that besides the dial, there isn’t anything new about this watch. It’s encased in the same (beautiful) 44mm titanium case, featuring an in-house, hand-wound P.2004 caliber. The colorful green dial is also outfitted with a handful of wonderful complications like a central chronograph, a half-hour counter at 3-o’clock, a 24-hour indicator at 9-o’clock and the power reserve right above 6-o’clock. While it might be the same, you can sure argue it looks better. 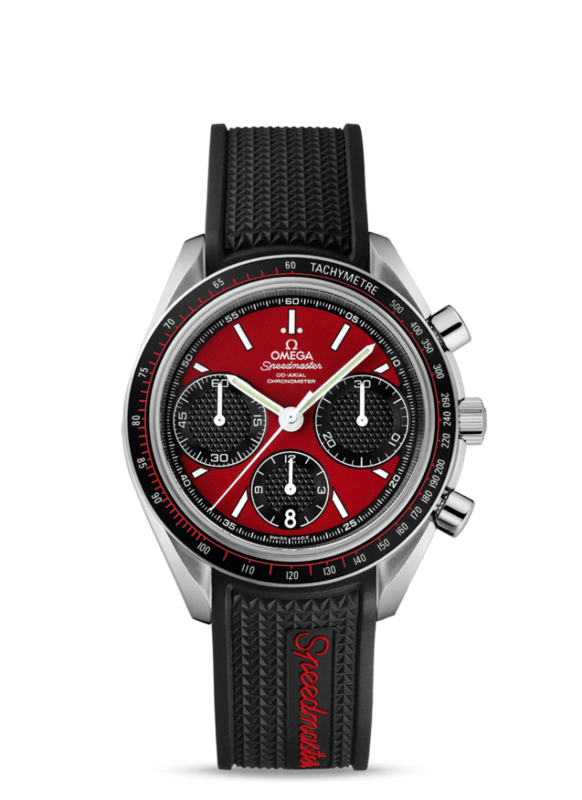 The crimson dial of this Omega Speedmaster is much more bold and eye catching than the first two — especially accented by three black subdials and a red-detailed tachymeter bezel. This watch is also sporty in looks and legacy. Initially a racing watch, the legendary Speedmaster has also been a part of all six lunar missions. That alone leaves collectors over the moon to own one. Inside this watch is a Co-Axial calibre 3330 – this is what runs the seconds sub-dial, the 30-minute recorder and the 12-hour counter. If you look a little closer, you’ll notice all three are backed by a wonderful Clous de Paris pattern. It doesn’t seem to take away from the red dial, though. What we also love about this watch are the tiny details — like the way ‘Speedmaster’ is written in red and that iconic cursive on the rubber strap, and how the bezel incorporated red markings across the circumference. You don’t have to be a fan of the Ravens, Lakers or Vikings to want to sport this purple-faced watch. This wonderful grape color feels regal and definitely adds some interest to an otherwise classic and understated watch. We love how the hands and hour markers remain simple to let the face shine, as well as how the purple pops against the durable stainless steel case and body. With a case of just 34mm, this watch sits discreetly on the wrist, although, that unique dial will have others doing a double take. Inside is an automatic in-house 3130 with a 48-hour power reserve, it’s also protected by a waterproof case and a scratch resistant sapphire crystal. You have a sweet tooth just looking at this, don’t you? This smooth, chocolaty-brown dial is equally elegant as it is playful, especially sitting pretty next to that everose gold bezel and case. What we love about a chocolate dial is that it’s fun and different, but the look remains elevated. It’s a watch that will spark a conversation, but certainly not take away from business. 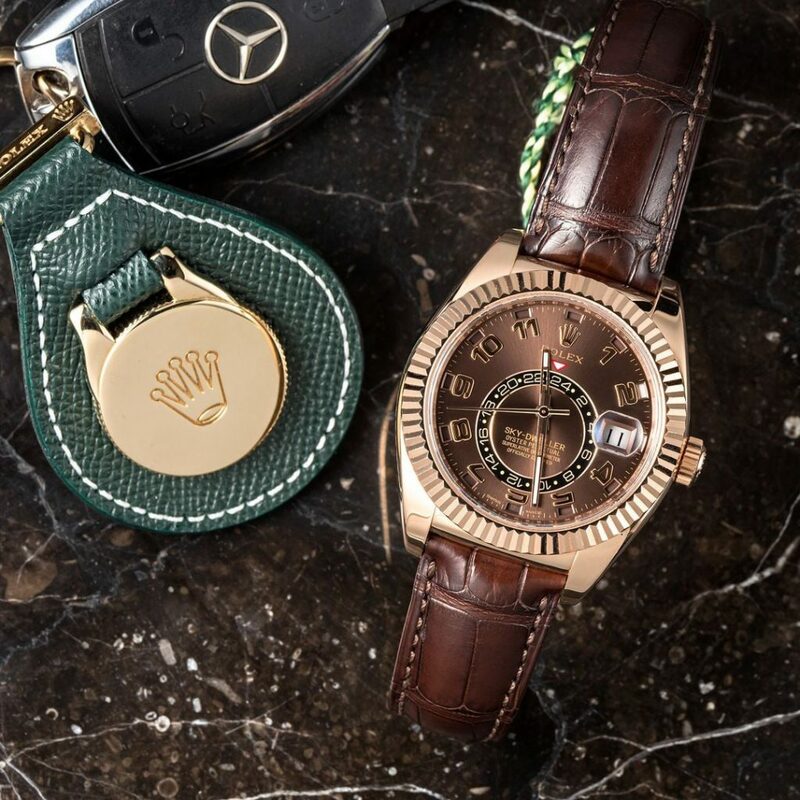 We of course have to note that the chocolate dial is on top of an incredible piece of watchmaking, the Sky-Dweller. This watch is outfitted with a 9001-movement, a Saros annual calendar and dual time zones. 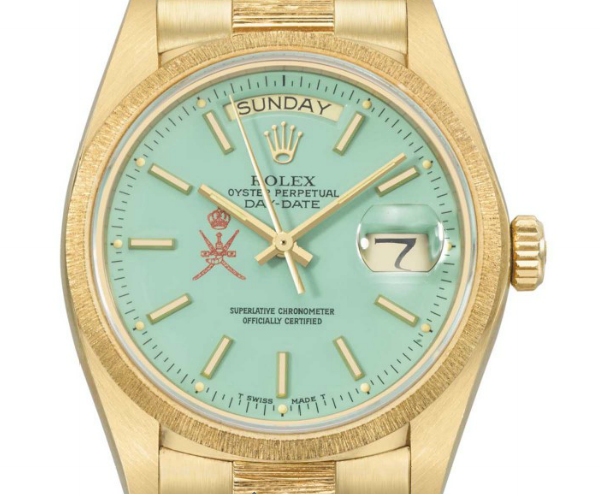 In fact, this watch is so advanced, Rolex took out over 10 patents for the technology and design for this very watch. Impressive (and handsome) to say the least. 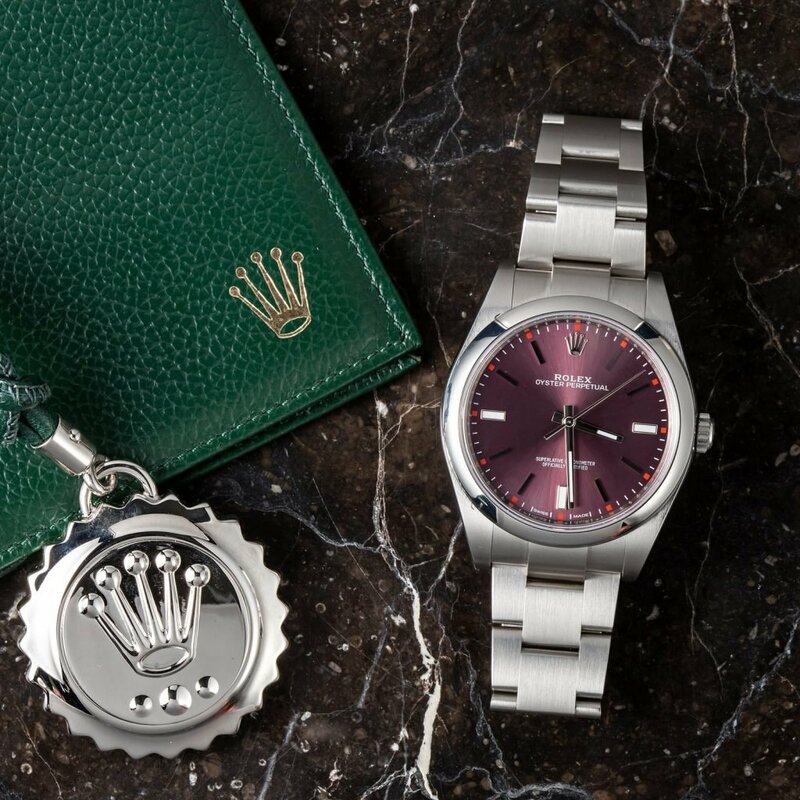 If you’re really looking to add a dash of color to your collection, a Stella Rolex is the way to go. These brightly colored dials were created in limited edition during the 1970’s for the Middle Eastern market — adding a touch of whimsy to an otherwise serious watch, the DayDate. You can find dials in colors ranging from fire-red to turquoise blue and coral pink. They’re quite hard to get your hands on, but if you do, it’s a great addition to your collection that will surely hold its value.